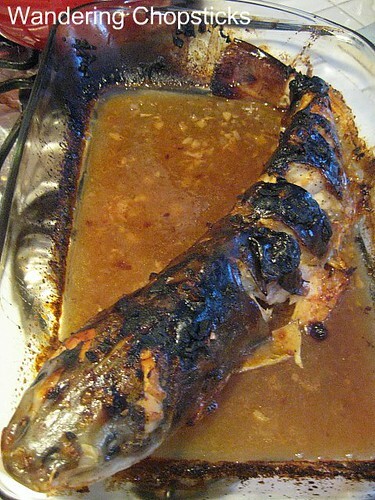 I know, I know, I tease you with a roasted catfish picture and then I veer off into discussions about chicken! What can I say, I'm not a sequential thinker. :P But mmm, let's see that catfish again yeah? Darn it! I wanted some homecooking. I actually had never roasted a catfish before so I decided to use the marinade from Ca Kho To (Vietnamese Braised Fish in a Claypot), figuring that if it doesn't char properly, at least the marinade will make it taste good. And boy, did it! I also had some scallions in the fridge that needed to be used up so I decided to make mo hanh (Vietnamese scallion oil) to pour sizzling over the top. The recipe turned out better than expected. So much so that the fish was eaten in minutes. As my brother picked a section for his wife, he told her our mom made it. No, she didn't. I did! Mommy only cleaned it. Huh! (Actually, he said the same thing a few years back when I made Cua Rang Muoi Tieu Me Toi Gung (Vietnamese Crab Stir-Fried with Salt, Pepper, Tamarind, Garlic, and Ginger). He started talking about how mom makes a sauce from the crab butter. Nuh uh! Mommy only sent down the Dungeness crabs. I made the sauce. Huh!) Anyway, since the first batch went so well, I made it again a few weeks later when my dad came down again and brought me two catfish. Clean and gut the catfish. Make cuts along the side of the fish spaced every 2 inches or so in order for the marinade to penetrate. In a separate bowl, mix 2 tblsp fish sauce, 1 tblsp brown sugar, 1 tblsp honey, 1 tsp black pepper, 1/2 tsp salt, 3 cloves minced garlic, and 3 minced shallots. Taste and adjust seasonings if necessary. Then slather the marinade all over the fish, making sure to get the shallots and garlic in the cuts to soak in flavor. Place the catfish on its side and bake in the oven for half an hour. 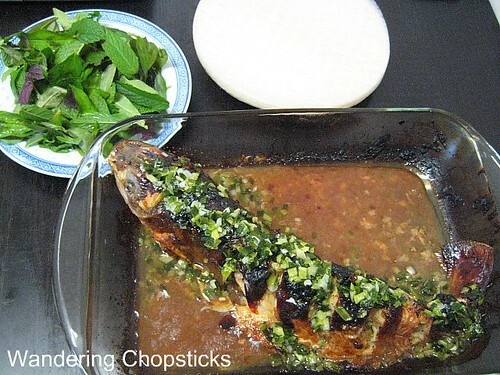 Flip the fish so it can absorb the marinade on the other side and bake for another half an hour. Meanwhile, make the Mo Hanh (Vietnamese Scallion Oil). You can turn the heat off and let the mo hanh rest until just before serving, then turn the heat on to high so the mixture will be sizzling when you pour it over the fish. After baking for an hour, turn fish right side up. Broil for 5 to 10 minutes until the skin chars and crisps like so. Here's a close-up of that tender flesh and crispy skin. But wait! You're not done yet. It gets even better. Take the fish out of the oven. Turn the heat on to high to heat up your scallion oil again and pour piping hot sizzling mo hanh on top. And look at it now! And another close-up of the fish. Serve with rice or rice paper and a plate of herbs for rolling. Dip with various fish sauces, or right into the marinade. The marinade is so tasty that I like to add a spoonful of chili paste and make that into a dip. The things I do for the blog. So after setting up that photo, I bagged the herbs and carried the ca nuong off to my youngest aunt's house for dinner where it joined the Hainanese chicken rice. Who made my recipe for ca nuong mo hanh? 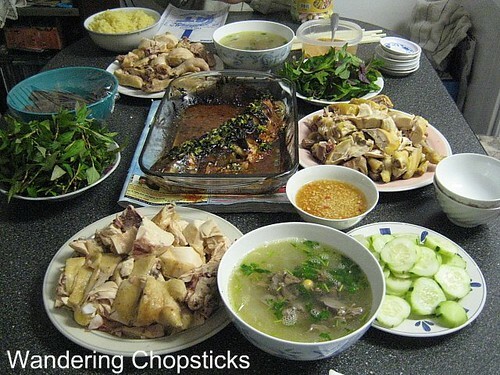 Hedgehog of Diary of a Novice Cook used trout and said, "The mo hanh (spring onion oil) makes this dish so worth-while. It feels sooo bad to see the chopped spring onions swimming in what seems like a sea of oil (I use nut oil) but boy, it tastes sooooo good." I'm submitting this recipe to Weekend Herb Blogging, a world-wide food blogging event created by Kalyn's Kitchen celebrating herbs, vegetables, or flowers. If you'd like to participate, see who's hosting next week. Why, the host is gonna be me! :) WHB is hosted this week by Cate of Sweetnicks. 1 year ago today, Atiso! Atiso! But I Am Speaking English! : Tra Atiso (Vietnamese Artichoke Tea) and Roasted Artichokes with Chili Aioli. I don't know if this catfish would make it for the car ride to anyones house. I'd be picking at it all along the way! Your crispy fish lathered in scallion oil is wickedly good. The catfish looks good and the meal at your aunt's place looks awesome! It looks so comforting and homey. Can I come over? Oh, what a delicious looking fishy! Your dish looks awesome. The scallion oil is a great addition. And, how cool is your Dad? He brings you fish he caught from Oregon! My mom makes something like this - she adds peanuts and fried shallots along with the scallion oil and we wrap it in rice paper with lettuce and herbs. So yummy. I can't wait to try this too. Tasty! The way you arranged the fish...looks like it was swimming in the sauce, hehe. I usually only eat this at Phong Dinh (Garvey and SG) b/c I get lazy when dealing with whole fish. I wanted to soak that rice paper and dig in right after I took the photo. Peanuts and shallots are awesome. Will keep that in mind for next time. Hehe. You're my first guest. Yeah, it takes me a while to get around to posting some things. I'll have to make a trip to Phong Dinh. I've eaten there before, just not the fish. Sounds fantastic. I really like catfish, which isn't that common in Utah. I've never had it cooked whole though. I don't even like catfish, and I"m tempted to try it. I will be back to your site for sure! I grew up eating fish with heads attached so it's no big deal to me. Perhaps you can get your kids used to it too? 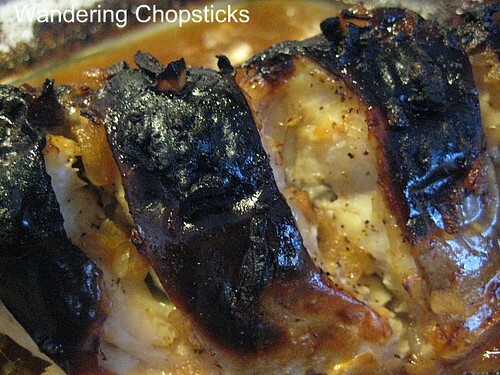 You can try this with catfish filets. The presentation will be different but it'll still be tasty. I use scissors to gut fish. So much easier to slit down the side and trim off fins and all that. You can buy fillets. Or buy a fish from an Asian supermarket. Most of them will gut and scale a fish for you. I'll have to post my instructions for gutting a fish then and once you see how easy it is, you can do it yourself. Some Asian supermarkets will also deep-fry the fish for you too. If you're feeling particularly lazy. I made this recipe last week for the first time for my sis and bros-in-law and it was a BIG hit. They kept asking if I made it or it was store bought:) I made 2 of 3.5lbs catfish for 8 people and they were gone quick. I left the fish laying on the side cuz I couldn't "stand it" up. what do you think if I marinate each side 30min first, then put it in the oven in the position like your pics for 1hr? BTW, I added water to the marinade cuz it was abit too salty. it works out fine. Thanks for sharing this recipe. I'll definitely make it again. Experiment. See if it works? 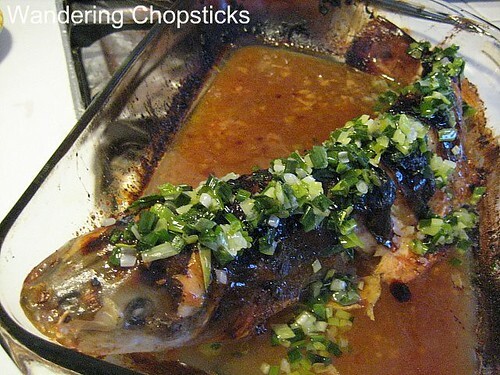 The reason why I cook it on each side is so the fish has time to absorb the marinade. Standing it up at the end is just to crisp it. Are you using fresh or frozen fish? Mine are from my dad, so they're frozen. Even though the fish is defrosted before I cook it, maybe more water is retained and then melted when it's cooked? If that's not the case, then I suggest adding water into the pan when you notice it drying out. Add the water near the beginning so it'll have time to thicken into the sauce at the end. Hope that works! The dripping is my favorite part. I scoop it out into a dish and add chili sauce and dip the fish with rice paper into that sauce. P.s. I shared the recipe to my sister and friend. They both loved it!!! This was totally amazing. I didn't have a whole catfish, so I used fresh catfish filets from the local fish market. It worked just as well and the cooking time was much shorter. Thanks! It's nice to know that the recipe works even with filets.